Grand National Thursday - get your ticket for only £15! The three-day Randox Health Grand National Festival gets off to a brilliant start with the renamed Grand National Thursday, which takes place on April 12th, 2018. Featuring some of the best Jump racing in the country, the new-look Thursday will also include a Champions of Merseyside feel to it, with a number of sporting champions involved in celebrating the best of Merseyside sport at all levels and all ages. From 1977 onwards, when the Randox Health Grand National Festival became an all-Jump meeting, Grand National Thursday has developed into an outstanding day of racing action, a true Day for Champions. It is only one of three racedays during the entire British Jump season to offer four Grade One (G1) contests. Uniquely, Grand National Thursday is the only day of the year with two open G1 races and two G1 contests for novices. The G1 chase action on Grand National Thursday is headlined by the Betway Bowl, staged over three miles and a furlong of the Mildmay Course. The fabulous roll of honours boasts the names of some of the very best chasers of the modern era with Wayward Lad, Desert Orchid, See More Business, Florida Pearl, Siliviniaco Conti and Cue Card all having been successful. Lizzie Kelly created history in 2017 when becoming the first female jockey to win the Betway Bowl aboard Tea For Two. The G1 Betway Aintree Hurdle moved to Grand National Thursday in 2013, having previously been on Grand National Day. The race is the only British G1 open hurdle run over the distance of two and a half miles. 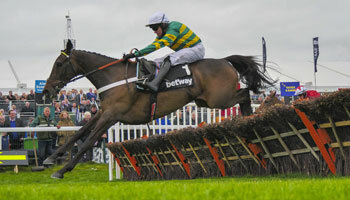 Buveur D'Air in April joined great performers Annie Power, Jezki, Istabraq, Morley Street, Beech Road, Dawn Run, Gaye Brief, Monksfield, Night Nurse and Comedy Of Errors by winning both the Champion Hurdle and the Betway Aintree Hurdle. Novice chase action on Grand National Thursday is provided by the G1 Manifesto Novices' Chase, first run in 2009 and staged over two and a half miles. This race commemorates an Aintree legend in Manifesto, who ran in eight Grand Nationals between 1895 and 1904, winning in both 1897 and 1899. The G1 Manifesto Novices' Chase roll of honour already includes Wishfull Thinking (2011), Menorah (2012), Captain Conan (2013) and Uxizandre (2014). Racegoers also get an opportunity to see racing over the Grand National fences for the first time at the meeting, with the two mile, five furlong Randox Health Fox Hunters' Chase taking place on Grand National Thursday. Restricted to horses who have run in point-to-points and hunter chases and ridden by amateur riders, the Randox Health Fox Hunters' Chase is a good race for multiple winners, with Katarino (2005 & 2006) and On The Fringe (2015 & 2016) both having scored twice since the turn of the century. Ultra-competitive handicap action comes courtesy of the two-mile G3 Betway Red Rum Handicap Chase which commemorates Aintree's greatest-ever horse, the three-time Grand National winner Red Rum. Stars of the future can be found in the concluding race, the G2 Goffs Nickel Coin Mares' Bumper, which is the richest mares' bumper run in the UK. Its title derives from the last mare to win the Grand National, the 1951 heroine Nickel Coin. First staged as a Listed contest in 2013, the Goffs Nickel Coin Mares' Bumper has rapidly established its place in the expanding British programme for mares and was upgraded to G2 status in 2016. To sum up, Grand National Thursday is a day to savour, with racing of the highest class, led by four G1 contests plus a G2 race, a G3 event and the Randox Health Fox Hunters' Chase over the Grand National course. 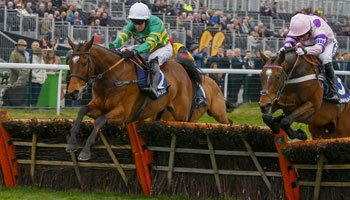 The evolving success of Grand National Thursday - A Day for Champions - is demonstrated by its growing popularity. During the 1980s, the attendance was below the 10,000 mark but has risen substantially, with the crowd figure now around 35,000. As a Rewards4Racing member you can get your ticket for Grand National Thursday for only £15 until 24th December, simply use offer code 'R4RGNTHURSFZ' at the checkout.